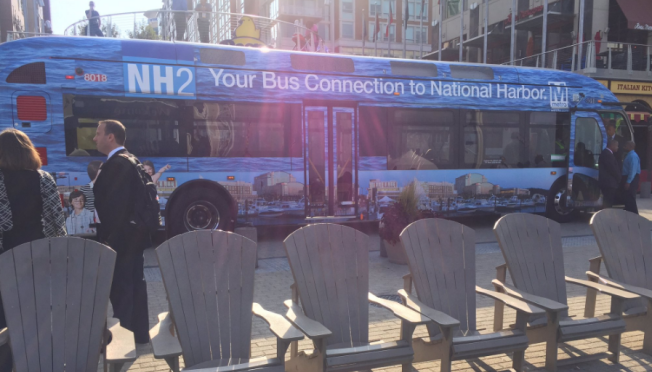 The NH2 Metrobus route will run from Alexandria to the National Harbor Plaza. The NH2 Metrobus route will run from Alexandria to the National Harbor Plaza starting Sunday, Oct. 23. The MGM National Harbor Casino will open on Dec. 8. The casino's opening is expected to double the number of cars in the harbor area. With the MGM National Harbor Casino opening in less than two months, a new Metrobus route will connect Northern Virginia with the National Harbor starting Sunday. The NH2 Metrobus route will run from Alexandria to the National Harbor Plaza. Officials from Metro, Maryland and Virginia held a news conference Thursday to celebrate new route. The Vegas-style casino and resort will open on Dec. 8, offering more than 125,000 square feet of casino space, hotel rooms and dining options curated by celebrity chefs. "The Theater" will host concerts, comedy shows and boxing matches. Some officials and local residents raised concerns this summer that the new casino would create heavy traffic around the harbor. The number of cars in the area will likely increase from 90,000 per week to 180,000 per week once the casino opens, MGM senior vice president Kent Digby said last month.